Oh Chase, you just really want bad publicity, don’t you? For God’s sake, just let this father of an injured active serviceman coming home from Iraq stay in his home a little longer so that the son has a home to come back to. After all, you are foreclosing because you told him to miss payments so he would qualify for a loan modification. 20-year-old soldier Aaron Collette is currently on a tour of duty in Iraq. Next month, he’s scheduled to return to Oregon for two weeks of hard-earned leave. After surviving an IED explosion next to his squad this month, Aaron is looking forward to some quiet time with his family. There’s a problem, though. Through no fault of their own, Aaron’s family will be kicked out of their home on August 9th – just ten days before Aaron returns. JPMorgan Chase is foreclosing on Aaron’s father Tim Collette, and has so far refused to modify Tim’s mortgage. Tim Collette is on a mission to save his home – at least, temporarily. He’s simply asking for Chase to delay foreclosure proceedings so that Aaron can come home to Oregon this summer. Like many homeowners in foreclosure, Tim Collette played by the rules. He put a $100,000 downpayment on his home when he purchased it back in 2006. But when the economy crashed in 2008, Tim’s cabinet refinishing business dried up. Tim struggled to make his mortgage payments each month, and eventually called Chase for assistance in restructuring his loan. The bank told Tim that he’d need to miss two payments to qualify. Once he did that (per the bank’s instructions), the bank began foreclosure proceedings. After yanking Tim around for more than a year, Chase decided not to modify Tim’s mortgage and scheduled the final foreclosure date for June 20th. When news of Tim’s story initially broke, JPMorgan Chase quickly told reporters they’d find a solution for Tim and placed his June 20th foreclosure on hold. But as soon as the media attention waned, the bank called Tim again and told him the foreclosure was back on – now scheduled for August 9th. Tim’s son Aaron isn’t the homeowner in this situation. But this is Aaron’s home. It’s his bedroom. His family. His safe place to return to after serving his country in Iraq. Chase Bank has already shown that, when under scrutiny by the media and with the determined advocacy of groups like Economic Fairness Oregon, they’ll delay foreclosure proceedings. Let’s see what happens when Change.org activists send thousands of messages to Chase Bank in support of Tim and his family. I’ve never had a Chase mortgage (thank God), and not underwater on my current mortgage, but still received this Chase loan modification notice in the mail. 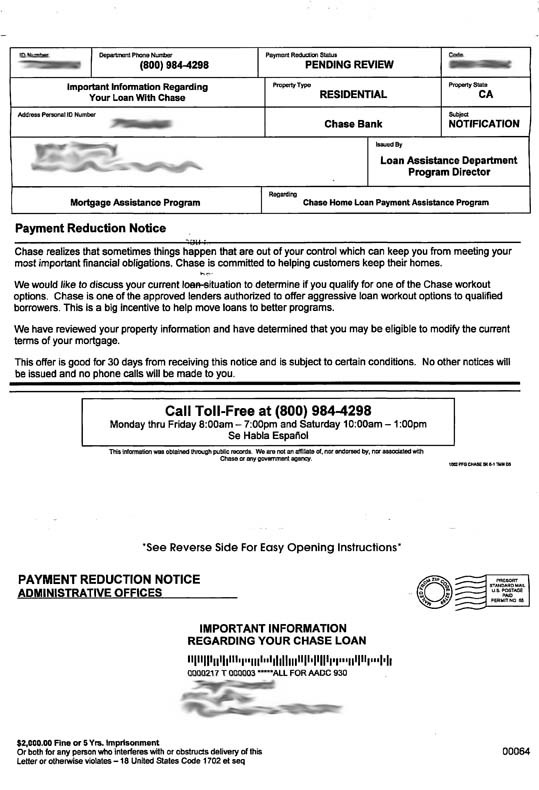 If you look closely the fine print on the bottom indicates that this isn’t from Chase, but from some other bottom-feeding company that will no-doubt offer to obtain a loan modification from Chase … for a fee. Please don’t be fooled by offers like this. The economic meltdown and the large number of people having trouble with their loans has bred a cottage industry of companies that exist only to scan people. A lot of our readers lament the day when Chase took over WaMu, and by all measures Chase made things worse for former WaMu customers. But here is a not-so-subtle reminder that WaMu was also a bank firmly steeped in ineptness and unpalatable policies. Without giving a reason, Chase has asked various courts to drop more than 1,000 debt-collection lawsuits against individuals (Lender Drops Pursuit of Debt, Wall Street Journal, 6/24/11). The suits were dropped without prejudice, meaning Chase can refile them later. Mitch Granat, a lawyer who handles debt-collection cases for J.P. Morgan in Palm Beach County, Fla., on a contract basis, said he was told by other lawyers for the bank that the suits in Florida were dropped because of “irregularities” in paperwork used to verify the validity of the credit-card debt being pursued. Some judges have complained that J.P. Morgan and other credit-card issuers that go to court to collect what they are owed file lawsuits marred by sloppy or even fraudulent documentation of debts. The problem is related to the robo-signing problem that has been widespread in foreclosure paperwork. Chase has been accused by several former employees of employing robo-signing tactics on consumer debt affidavits. One of the former employees claims that Chase has incorrect information on balances owed on thousands of credit card accounts. Many lenders farm out debt-collection lawsuits to outside law firms. In contrast, J.P. Morgan predominantly uses a team of in-house lawyers scattered across the U.S. Last month, some of those lawyers say they were told by company officials that all the collection offices where they work will be shut down by the start of 2012. J.P.
Dishonesty seems to be in the Chase corporate culture with this latest admission by Chase that it lied about the quality of mortgage-backed securities it sold to other banks and credit unions (Marketplace, 6/21/11). As it sold the securities, it claimed they had near-zero default levels, but almost immediately after they were purchased, defaults soared so high the securities became almost worthless. Bogus securities sold by Chase and the Royal Bank of Scotland lost so much value they caused the failure of five credit unions. Yea, these are the guys that are watching your money. Still think Chase doesn’t arrange your deposits and debits to cause overdrafts? Let me start off by saying that I have a impeccable financial history and 760+ credit score. I recently moved from Western NY to NYC and needed to switch banks, so I opened up a basic checking account through chase.com. Gravy. I set up my username and password and linked my chase credit card that I had from before to my new checking account. Again, gravy. A few days later I try to access my account, but it is blocked and says to call an 888 number. I do and am told that my checking account was restricted for some unknown reason and that I had to go into a branch with two forms of ID to straighten things out–which I do. The branch manager tries to help me figure out what’s going on. He get bounced around the system when he calls cust. service for half an hour while I sit there twiddling my thumbs. I swear I heard him give his credentials and reason why he’s calling at least 4 times. Eventually, he hangs up and informs me that chase does not wish to do business with me and that they don’t have to tell me why. Ok, I’m fine with that even though I could not fathom a reason why. I’ve never missed a CC payment, never declared bankruptcy, never been arrested, etc. Oh, I should mention that I made a $1500 deposit upon opening my new account with chase from my Discover savings account. When I asked when I would get my money back, he told me that I should be getting a check in the mail within 5 -7 days. Fine. A week goes by. Surprise, surprise, no check. Now I discover my access to my credit card account is also restricted, which I was told was fine when I asked the manager about it when I was at the branch. I call again. They tell me to go back into the branch, which I do. Same guy. Same bouncing around, but this time for over an HOUR. Apparently no one knew where the hell my $1500 was and know had the authority to reset my user ID and pw for my CC. I went into the branch at 2:50pm and came out at 4pm. In the end I was kicked out of the branch because it was past closing hours, and I walked out with zero answers. I am praying that I will see that check in the mail before I have to go to the branch for another session of hell on Monday. I could not care less about my chase CC now. I just paid of my balance over the phone and am putting it away. I would cancel it out of spite, but thought it wiser not to because I don’t want to end up lowering my credit score b/c of this insanity. Utterly ridiculous! I can say for certain that I will NEVER go anywhere NEAR chase EVER. I’d rather be shot in the stomach and die a slow death than give these idiots my money. The day after my first hell session, I went over to Citibank, which I should have done in the first place, and had my checks/card in my hands within 5 days. Wow. Recounting this story really ticks me off. Kudos for those of you who made it through to the end and long live Citibank! What gives when Chase calls you to offer a short sale? Hello, I have a property which was a 2nd home. My brother-in-law and I bought it 7 years ago in Nevada. A few years back I started covering my brother-in-laws share. I’am about six months unpaid and presently the property is in foreclosure. I have sent no paper-work as request since it is biased. Well around 2-months ago during the foreclosure I got a call from a Chase rep. on a Sat. morn. stating that I qualfied for a short-sell. He asked me if I wanted to proceed and to select from a list of real estate brokers they have used in the area or if I had an agent. I said I have a real estate agent and set a conference call between the rep, agent, and I. We just had an offer and I accpeted, though now they want me to sign my life away. The document they sent me is called a request for consideration of Short sell? They requested the and even set-up the short sell to me, and they offered me a 25.000.00 check upon closing with no forbearance. Have you heard of people not giving any paperwork and going this far? This is very misleading! Should I get a lawyer? Get a lawyer! Chase is a sneaky bank and it is more likely than not that this will benefit them somehow. For one, Nevada appears to be a state that allows for a deficiency judgement, which means that they can go after you for the amount you ow in excess of that paid on the loan through the short sale. California by comparison is a state where you can not be held liable for additional debt as a result of a short sale or foreclosure. Until Chase either forecloses or the property is sold, they can’t do anything to go after you for the unpaid loan balance. For agreeing to a short sale, you allow them to move forward on obtaining a deficiency judgement and going after more of your assets. Furthermore, Nevada appears to be a one-action recourse state, which means that they can either foreclose on your property, or sue you to recover the unpaid debt, but not both. By agreeing to the short sale, you are allowing them to sue you for the unpaid debt whereas otherwise they would not be able to if they foreclosed on the property. Let me repeat my first remark – get a lawyer, preferably one familiar with Nevada law. I am in litigation v Chase. My premise is that Chase incentivized employees in modification and foreclosure departments to my detriment. If anyone can speak to this issue, please respond ASAP. If anyone can help, please contact us through our contact form or leave information in the comments.